No doubt about it, stepping into that baby ward flooded with memories, bursting with the babbling and innocent beauty of babies, I could not stop my heart from searching for my daughter. The sight of sleeping little girls with intricately braided hair melted my heart. I also watched for Emma endlessly as we drove through Nairobi, and especially when we passed through slums. My gaze flitted from one face to the next, scouring every dark corner and alleyway for a little girl, about three years old with high cheekbones and big warm eyes. There was an echoing emptiness in Nairobi without Emma, but also a sliver of hope for something new. In the absence of Emma’s miraculous return, perhaps the Lord would release my heart to love another child. David and I settled into the rhythms of leading a team of four female college students and our three boys, ages 4-7, in serving at Mother Teresa’s. Jacob, age seven, innately tender and compassionate beyond his years, took an active role in playing with babies and helping wherever possible. Justin, four-years-old, easily interacted with the children. Jedd, also age four, returning to a place with myriad memories, clung close to me. We intentionally and explicitly explained to him over and over that we were only visiting. He would be going with us to the orphanage each day, but he would always come back with us to the place where we were staying, and when we went home to the US, he would be with us. At first, I thought his anxiety was related to returning to a place where he was abandoned and sick, but I soon realized he was deathly afraid of one child in particular. He reacted whenever she passed near us by screaming and wrapping himself around me, as though he wanted to climb inside me. I felt so badly for the girl, even as I recognized he was unable to control his response. The child, Cynthia, was about eight years old and badly scarred. Her parents tried to kill her when she was younger by pouring scalding water over her, leaving her face terribly deformed and even fusing some of her fingers together. Jacob easily looked past her physical appearance and didn’t hesitate to play with her. Justin, also, seemed indifferent. Perhaps for Jedd, the visual reminder brought back other unbearable pre-verbal memories. We spent time at the orphanage talking as a family about her appearance and the person of great value inside, and prayed for her. Jedd’s anxiety seemed to decrease with time, and I always kept him close. For Cynthia’s sake, he and I avoided the ward where she lived. I heard before we arrived that the orphanage caregiveres switched to feeding even the youngest babies with cups instead of bottles because they lacked adequate means of sterilization. The practice seemed so harsh; and yet as I visited with Sr. Stansalata, the new sister in charge of the babies, I understood her heart and intentions. As well as these changes, she strictly limited visitors to the baby ward. As a result, illness and death were declining. She also installed mosquito nets and added toys and mobiles. The babies seemed to adore her and called her, “Mama.” The ward felt warm and bright. She knew Jedd from when he was a baby, and she was delighted to see him again. In fact, we learned she was the sister who received him at the gate from the police, baptized him, and gave him the name “Josephat” because he was born on the day the church celebrates the angel’s annunciation to Joseph. Our hearts knit together instantaneously. Every evening, the students returned to our hostel with us along with a beautiful little boy who was born in Kenya and cared for in the same orphanage where they were serving. They could see him thriving as a full-fledged, beloved member of our family. Playing with him every evening and bonding with him did not allow them to de-humanize the orphans or somehow imagine the orphans would not feel everything any other human baby would. In the evenings before dark, we often walked into the little town area near our hostel. A strange little troupe we were – a tall, 6′ 2” white man with an older white woman, four younger white women, two little white boys, and a black boy. We liked to buy sodas at the local grocery store and sit outside, watching everyday Kenyan life flow by. One day, a local man approached us with a puzzled expression on his face. He asked my husband, “Who is the mother?” motioning at our two white children. My husband motioned towards me. “And that one?” he asked, motioning at Jedd. Again, my husband pointed to me. The man looked extremely confused, and walked away, shaking his head. The girls, however, were appalled. In a society where polygamy is common, they realized the man assumed we were all one big happy family, and not just in a fun, team kind of way. One morning during our first week, the boys were particularly tired. The night before, in fact, Justin giggled in delight as his head hit the pillow and he closed his eyes. So I stayed back with them while Dave and the students went to the orphanage. When they returned, the team expressed great concern for a little girl named Sarah. My friend, Debbie Lee, again leading the project with her husband, Brian Lee, visited the team that day and was also worried about Sarah. An American nurse, she could easily identify illness. I checked on Sarah right away the next day, only to find her vomiting all over the floor. She was rail thin and vacant-eyed. Fear boiled in the pit of my stomach. I asked Sr Stansalata about her, and she told me Sarah was HIV positive. Another orphanage sent Sarah to Mother Teresa’s to die, she said. She made me promise not to share the news with anyone because of the stigma. She did not want the workers to neglect her. She wanted Sarah to be loved as well as possible until the end. Crushed, I went back to the ward, held Sarah, and wept in disbelief. Three small babies were on IV’s, and St Stansalata suggested we take them to the hospital the following week with the funds we brought from Hope’s Promise for medical care. Our team also noticed a little girl in the older kids’ ward. About seven-years old, she lay in a coma while someone always kept vigil. That day, the sisters took her to the hospital themselves. I bonded quickly with a happy little girl named Daletta, and both David and I spent time playing with her every day. I couldn’t help but wonder if she was our long-awaited daughter. I also checked on Lilly. The workers said she was often sick with respiratory illnesses. I tried to feed her once, but she refused. They said she often declined food. I noticed a scar in the corner of her mouth from force-feedings. The sisters were always tender and gentle with the babies, but sometimes the hired workers were rougher when the sisters weren’t around. I tried to contact some pulmonary doctors in Nairobi, remembering my promise to Janet to seek medical care for her. But I was never able to connect, and Lilly was relatively healthy during the early part of our time there. Over the weekend, we visited a church in Mathare Valley, the second largest slum in Nairobi. I met the pastor briefly in 2002 when we visited the Compassion-sponsored child of one of my students. Pastor Karau served at the Compassion project’s sponsoring church. He and his family were also faithful partners with the InterVarsity Global Project and a good friend of the Lees. They hosted students year after year. Secretly, I felt intrigued with him from the moment I met him. Like the sisters, he served in one of the darkest, saddest, most desolate environments. But he had the same twinkle in his eyes, lightness of spirit, and contagious joy. What were these people on? And how could I get it?! We drove to the edge of the slum, overflowing with people – somewhere between half and a full million crammed into six square miles of abject poverty. We stopped at a rough cement block building, a new church founded by Pastor and Mama Karau just that year. We ducked into a small, almost window-less room. A few dozen people filled simple wood benches. During the week, we learned, the space served as a preschool to reach out to the surrounding community. The joy as people worshiped could not have contrasted more sharply with the conditions I knew they emerged from that morning. Pastor and Mama Karau promised to invite us to dinner soon, and I looked forward to their invitation with all my heart. I emailed people from my church after visiting Mathare Worship Centre. I had committed to travel with a small reconnaissance team in October to explore ministry opportunities in Kenya. I highly recommended that the team and my pastor plan to meet the Karaus and visit the slum church. Briggs boys with Pastor and Mama Karau during our first visit to their home, 2004. The following week, Sr Stansalata identified four babies who needed medical care at the best children’s hospital in Nairobi, Gertrude Gardens. One tiny little girl, Catherine, suffered from a massive boil across half her back, and three little boys had terrible coughs. The workers prepared the babies for their outing, which meant wrapping them in huge bundles of clothing and blankets despite a temperature in the mid-70’s Fahrenheit. Meanwhile, Debbie, who came with her husband Brian to help with our hospital visit, and I checked on Sarah. She was feverish and withdrawn. Our hearts broke for her. We had both prayed that morning for the sisters to allow us to take Sarah to the hospital. We went to find Sr Stansalata. Sr. Stansalata’s response, although not unexpected, shook us to the core – for Debbie, it felt contrary to the basic values she embraced as part of her American medical training, to save a life by any means possible. For me, it challenged my core hope for every baby in the orphanage to live and thrive. Sr Stansalata explained: She will die anyway, let her die before she faces the intellectual understanding and emotional pain of knowing she was abandoned. Medical care will only prolong the inevitable. Let the sisters love her well until it is time for God to take her home. Let me help her die with love. In our shock, we pleaded with her to allow us to take Sarah. Perhaps there was something we could do to help Sarah feel more comfortable. Jesse, Aimee, and me – taking babies to the hospital, 2004. At Sarah’s first examination, she weighed half what she should for a two-year old and her fever ran very high. The doctor’s countenance changed when I told him of her HIV positive status. He diagnosed her with pneumonia. They also discovered her hemoglobin count was too low and recommended a blood transfusion. As a matter of procedure, they tested her blood for HIV, but the results would not be ready for several days. I prayed with all my heart that somehow it would come back negative. Sarah’s physical suffering was painful to witness, but her emotional brokenness was the most tragic. She never made eye contact and maintained a hollow expression. Two babies were treated and released. Will, diagnosed with pneumonia and malnutrition, and Sarah were admitted. My friend Debbie with Sarah before first exam, 2004. We proceeded to a group ward, clean and bright. Kenyan Mamas sat in chairs next to about ten metal-slatted cribs. I evaluated the situation. I knew Agnes worked 10-11 hours, 7 days a week. I didn’t want her to have to stay the night, and I also didn’t want to leave the babies alone. So I volunteered to stay. The others left, and I settled in for the night. Gertrude Gardens is a beautiful hospital and an excellent pediatric facility. Mosaics and murals decorate the walls, and the buildings surround a large courtyard with playground, trees, and lovely flowers everywhere. Open air breezeways connect different sections. The group ward was a happy, bustling place with big windows. The nurses were well-trained and obviously loved children. It seemed obvious they operated under a policy that whatever a child wanted should be given to him or her. They dressed Sarah and William in warm, soft pajamas and settled them in side-by-side cribs with bright clean sheets and fluffy comforters. When I processed the experience later with David, I cried. In five hours, Sarah went from the bottom of the heap, stigmatized and abandoned in an orphanage to die, to a princess who could have whatever she wanted. Sarah at Gertrude Gardens, 2004. The nurses brought porridge for dinner for Sarah, but she was not interested. She sat there, thin and delicate, with her spindly legs crossed while I tended to William. Then she noticed an older child eating at a table in the middle of the room. She lifted her tiny arm, just skin and bone, and pointed. I offered her the porridge again. She shook her head and turned away, never dropping her arm. Her face remained expressionless and she didn’t make a noise, but she just sat there pointing with every ounce of her determination. Other mothers started to notice with smiles. I asked a nurse for some of whatever the child was eating, but the mother of the child brought some over before the order arrived. Sarah’s face remained expressionless as the gift of “chips” (French fries) and ketchup arrived, but she plowed right through them! Later, when my dinner arrived, she pointed at it. She loved the rice, even searching for stray grains on her bed. Even in the moment, I felt the mystery of sharing my dinner with an HIV+ orphan, half a world away from my home. Later in the evening, I put on gloves to change Sarah’s diaper. I pulled them on halfway and wiggled the fingers in her face. She smiled! William fell asleep, and I held Sarah until she drifted off, then settled her in the big comfy crib. My bed was not so comfortable. I sat on the chair and pulled up a plastic chair for a footrest. The ward fell silent after 10 pm except for the tv, running through most of the night. The American show “Friends” aired for awhile, then the news. I slept off and on through a segment about a Kenyan mother who was arrested for trying to drown her newborn baby in a pit latrine, “Bob the Builder” with a British accent, and a Christian praise music show. About 5:30 am, the nurses began making their rounds. Sarah once again refused porridge and pointed at another child’s meal. They brought her corn flakes, and she contentedly chomped on them while I fed a bottle to William. I was happy he was so hungry. He ate about every 1.5 hours throughout the morning. The nurses ran some bath water for Sarah. At first she cried, but then she seemed to enjoy the water. She did not smile, but every now and then she dared to meet my gaze for fleeting seconds. I hoped she would make extended eye contact before I left Kenya. Agnes needed to leave Nairobi for her mother’s funeral services. Short-staffed as always, the sisters had no one else to send. The students and I decided to serve as Sarah’s and Will’s temporary guardians in shifts, at least during the days. As Leah and I prepared for our turn on Friday, Kenyans warned us of big political demonstrations planned for the weekend. They suggested we pack and plan to stay the night. When we arrived at the hospital, Sarah and Will were still in the general ward. Sarah remained sad and unsmiling, but retained her strong opinions about food. After she ate lunch, she obviously wanted more so I asked the nurse. While we waited, she pointed at a woman across the room who was eating “chips”. I tried to explain to her that her food was coming and held her to comfort her; but she arched her back and screamed, then turned and bit me! The woman noticed and quickly brought the potatoes over to share with Sarah. Other times when I carried her, if I didn’t walk the way she wanted, she lashed out and tried to scratch me. I wondered what kind of abuse and neglect she experienced in the former orphanage. Leah and I kept a record throughout our stay of what she ate and what transpired. The note-page from Friday is filled with notations about food eaten and vomited. We learned there were private rooms available, and transferred to one that evening. Somehow we ended up with a balloon, and Sarah was fascinated by it. She almost smiled. I laid her down in the crib to get her ready for bed and suddenly, she did smile! I played little hand games with her, and her gaze remained locked on mine. I tickled her belly and she laughed. Shortly after, she seemed very tired. I told her “la la” (“sleep”). She leaned forwards onto her belly. I bent over to kiss her and told her “la la salama” (“sleep in peace”) and “nakupenda” (“I love you”). She smiled with her eyes closed and fell asleep. Leah captured Sarah’s smile that night. I felt awash with joy at the glorious gift of breaking through to her, of knowing that for at least one night she felt loved and happy enough to smile and make eye contact. With just a single bed in the room, Leah and I each huddled on half of it, with our feet by the other person’s head. That, in and of itself, would probably have prevented solid sleep; but I tossed and turned through the night, pleading with God to let Sarah’s HIV test return negative. Too exhausted to pray coherent prayers, I just mumbled in my mind “Tafidhali” (“please”) over and over whenever I became conscious, all night. The next day, I took Sarah out to the beautiful green hospital courtyard where monkeys played in the treetops. The warm sun on my face felt so hopeful. I leaned my cheek against hers and rested my hand on her head. I begged God to let her live. I envisioned her blood transfusion the day before, and asked God to take the terminally sick blood from her body and transform it into strong, healthy blood. It was a silent, soul-deep groan. Her test results would be available on Tuesday. 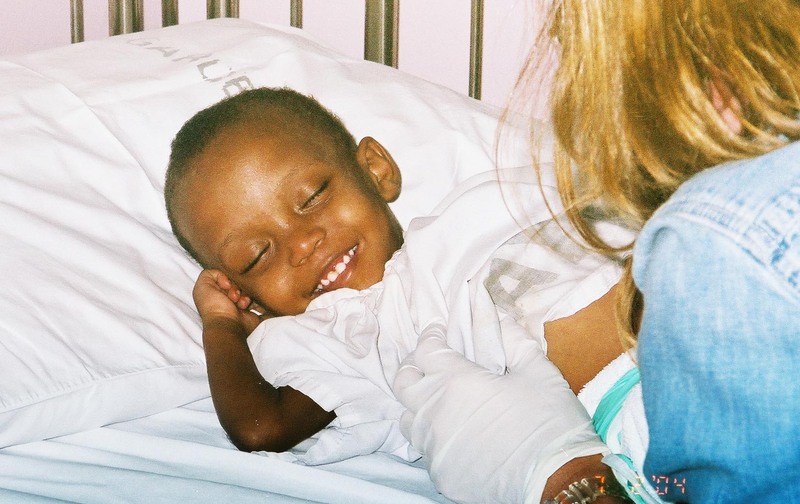 Saturday brought about steady improvement for both Sarah and Will, and the hospital decided to release them back to the orphanage that evening. It was dark when we pulled into the compound, and the other children were asleep. A worker received the two bundles with hushed whispering. I wondered if Sarah would miss our intimate care over the last 30-plus hours. Leah and I turned to walk away, our arms strangely empty. I felt like my heart was caught in a long slow burn. On a roller coaster of emotions – longing for Emma, wondering if one of the little girls in the baby ward would become our daughter, but hearing nothing from the Lord; longing for life for Sarah and overwhelmed by her emotional pain. I told a hospital worker during Sarah’s stay that if her test came back negative, I might adopt her. Sometimes, like when I worshiped with the people in Mathare Valley, when my boys or our student team glimpsed God’s heart for the orphans and the world, or when I saw Sarah’s smile, I felt relief, joy; but the smoldering pain crept back, inextinguishable. I wondered if I would ever find my Emma. I felt discouraged, disappointed, and sad. So very sad. At the same time, I prayed for the burn to leave a heart yielded only to God and His purposes. Being in the hospital with Sarah, I could not spend time with Daletta. I told David early in our visits I wondered if she could be the one; but neither of us experienced a strong sense of leading from the Lord. One day, after Sarah returned to the orphanage, our team entered the Mother Teresa compound. We saw a Kenyan woman holding a baby. “Is that Daletta?” one of the students asked. The woman’s face flooded with happiness and she affirmed Daletta was the answer to her prayers. Our team crowded around her excitedly, asking questions. She worked for a university and her husband worked with Missionary Aviation Fellowship. They had two sons, but longed for a daughter. I shared with her David’s and my particular fondness for Daletta. In fact, David saw them later walking around the compound and Daletta reached for him. He felt the sadness of letting her go. Even so, we knew the Lord confirming that she was not to be ours, and we felt the joy of knowing she would have a loving Kenyan family. And then came the day to receive the results of Sarah’s HIV test. I took a taxi to the hospital. It was a day when time stood still. The warm equatorial sun hit my face as I walked into the doctors office, rimmed with glorious green gardens. Standing there in the office with warm breezes filtering through open windows, I waited, hoping against hope. I wanted to pray, but couldn’t find words. Finally, they handed an envelope to me. I opened it. Written in words as permanent as a tombstone engraving, it read: HIV +. if I weren’t sitting at work, I would be bawling my eyes out. You are an amazing women! Thank you so much for reading Tara, and for taking the time to comment. I’m actually so ordinary and messed up, you wouldn’t believe it! But I thank God for allowing me to have some extraordinary experiences! I need to circle back and keep writing – I got distracted with some other projects. The rest of the “book” will be about the 7.5 months I was “trapped” in Kenya….